Featured on Beta List! How we did it and what did we gain? Featured on Beta List! How we did it and what we gain! Saturday, 21 February 2015, was a great day for us at Pikiz. We were featured on Beta List, one of the largest startup directories. I’m writing about our experience, what happened and what’s next for us. We decided to start engaging subscribers and future users while we were developing the product. We had just released our private beta six weeks before and we needed to collect information about potential users of our product. We built some landing pages and started researching and contacting these users. We tried to make our landing pages simple, eye-catching and original. There were different landing pages with content adapted to each of the user personas we identified. How we got featured on Beta List? We submitted Pikiz to Beta List on Friday, 30 January 2015. Then, three weeks later, February 20th, we noticed that Marc Köhlbrugge, CEO of Beta List, had signed up on our landing page. We were very excited! That was a really good news for us! We trended for one week and kept the first place for three days after being featured. A couple of days after being featured on Beta List, we had a 400% increase in our number of subscribers. We think it was due to Beta List subscribers being interested in new apps and products. They were also within our target market, which made them more likely to be converted. Does Beta List require you to pay to get featured? Getting listed on Beta List is free of charge. However because of the number of submissions that Beta List receives each month, the waiting time for getting featured is quite long. It was three weeks in our case. If you want to skip the waiting queue in case you are in a hurry, the paid option is for you. It costs $99 and allows you get an expedited review. Paying is not required, only optional. If you pay for the expedited review and are unhappy with the results, Beta List will send you a full refund while keeping you featured on the website. Is it worth $99 to be featured on Beta List? Beta List users match our target market. We’re able to confirm that our landing pages messaging is decent. We had some users we can get feedback from. Several users requested a premium version of our product. If Beta List users are also your target market, it’s a great way to quickly find your early adopter and a valuable exercise that helps you prepare your launch. So it’s well worth to pay to be featured if the waiting time is too long for you. How to submit your startup? Your product is not yet available to the public. Your website has a custom designed landing page. No templates. 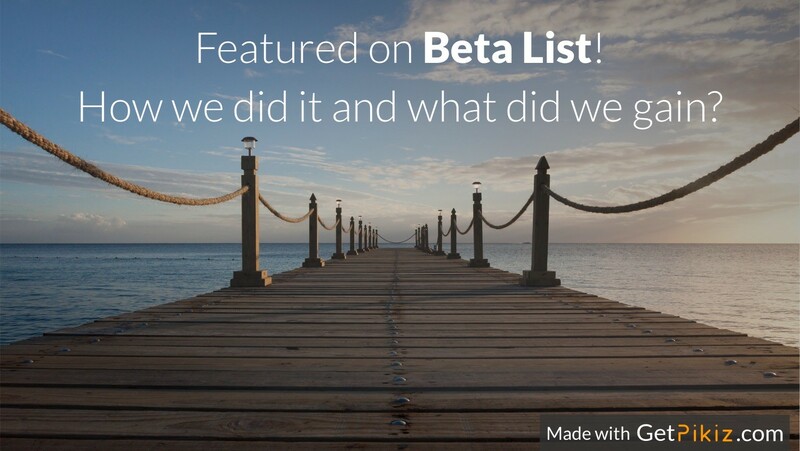 Your startup has not been published on Beta List before. Visitors will be able to subscribe to a mailing list to get notified of the launch. 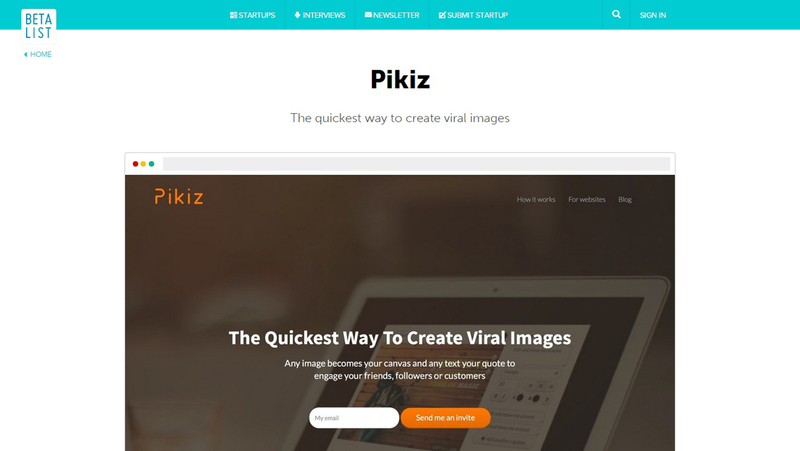 Example: Pikiz is a tool that allows anyone to easily create and share viral images from anywhere on the web. With Pikiz, customize images or texts directly where you find them on the Web. The process is fast and seamless, yielding high quality images to be shared on social media, for communication campaigns or simply to make your friends and family laugh. The submission process to Beta List is simple, fast and seamless. To begin, just sign up with your twitter account. If you don’t yet have a twitter account, you should create one. Once logged in, you’ll be redirected to the submission page. What Happens after Beta List? We got new signups with our private beta launch. Now, our challenge is retention. It is great to have new users, but it is better to engage with them. The feedback they provide will allow us improve our product to offer them the best tool. We’ve started interacting with our subscribers to get better understanding of who they are and what they need. That allows us to know which features to build and which not to build, what works perfectly and what doesn’t. If our product solves the users’ needs, they will love it and use it more and more. Getting featured on Beta List was a great experience and we would do it again if we had to. By the way, have you tried Pikiz yet? Discover the best way to create viral images here. And don’t forget to follow us on Twitter @getpikiz.